Perfect365 is a graphics touchup application which can apply several different effects to images which improve the look of faces. Some of the effects supported here are teeth whitening, blemish removal, red eye removal, improvement of the appearance of eyes/nose/cheeks and even overall smile improvements. To get started with the program, just launch it and choose a portrait to edit. The face(s) on the image are then mapped. 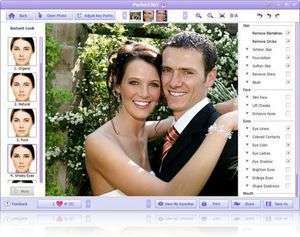 Perfect365 1.8.0.3 is a shareware program and can be used as a demo to try the software until the free trial period has ended. A full version of the program is available after the trial period ends. For security reasons, you should also check out the Perfect365 download at LO4D.com which includes virus and malware tests. Additional screenshots of this application download may be available, too. Perfect365 has a presence on social networks. Perfect365 download been highly rated by our users.